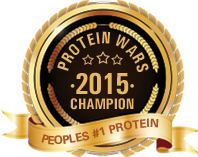 NutraBio Wins the Protein Wars for the second consecutive year! NutraBio’s 100% Whey Protein Isolate has won the Stack3d Protein Wars for the second year running. We are the first brand to ever win this people’s choice award for most popular protein twice. Stack3d, the organizations running the Protein Wars, released the following: “After five weeks of competition, we’ve finally got this year’s Protein Wars champion. We had a few close rounds early on, but eventually it came down to last year’s winner NutraBio Whey Protein Isolate, and a supplement that actually only launched this year, MAN Sports’ Clean Protein. Both products would’ve made great champions, however in the end it was NutraBio that came out on top. “I would like to thank all of you who supported us. There are way too many names to mention and I don’t want to leave anyone out. So, to our customers, athletes, employees and friends; I appreciate each and every one of you. The support you’ve given NutraBio and the confidence you’ve had in me over the years pushes us forward. Your support means everything and without all of you we would be nowhere. Click here for more information on NutraBio Whey Protein Isolate…. This entry was posted in NutraBio Nation, Industry News, Quality. Bookmark the permalink.